One of the enduring images of southern Italy is that of three Greek temples standing in fields of wild red poppies. The trio are among the best-preserved monuments of Magna Grecia, as the Greeks called their colonies in southern Italy and Sicily. Paestum, or Poseidonia as the city was originally called (in honour of Poseidon, the Greek god of the sea), was founded in the 6th century BC by Greek settlers and fell under Roman control in 273 BC, becoming an important trading port. The town was hit by the successive blows of the retreat of the Roman Empire, savage raids by the Saracens, and was gradually abandoned. Its temples were rediscovered in the late 18th century by road-builders. 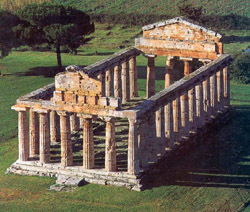 At the ruins, the first temple you meet on entering the northern end is the 6th-century BC Tempio di Cerere. Smallest of the three temples, it served for a time as a Christian church. 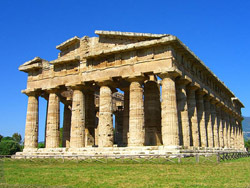 Then there is the Tempio di Nettuno dating from about 450 BC, is the largest and best preserved of the three temples. Almost next door, the so called Basilica is Paestum's oldest surviving monument. In its time the city was ringed by an impressive 4.7km of walls, subsequently built and rebuilt by both Lucanians and Romans. The most intact section is south of the ruins themselves. This well-appointed museum just east of the site, houses a collection of much weathered metopes (bas-relief friezes), including 33 of the original 36 from Tempio di Argive Hera, 9km north of Paestum, of which virtually nothing else remains. The Diver's Tomb is an extraordinary example of painting from the first half of the 5th century B.C. In fact, it is likely that the Paestum composition emulated older Etruscan designs, undermining the now outdated art historical judgement that Etruscan art was merely derivative and that Etruscan artists never set the standard for Greek artists. 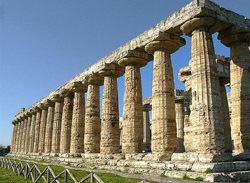 THE PRICE OF THIS TOUR OF PAESTUM IS EURO 150. ENTRANCE FEE ARE NOT INCLUDED.